What an exciting weekend! 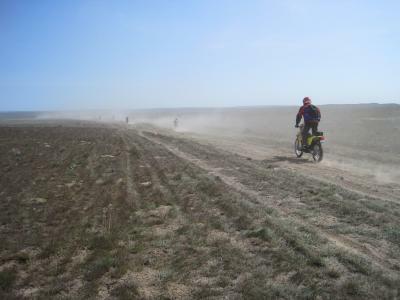 Jeremy, Brianna, Don and Paul headed out to Odessa, Washington for the 40th annual Desert 100. Windy, cold, dust everywhere… But it was nice that the sun was out both days, which made for a great time in the desert. We enjoyed meeting new people and seeing old friends, hearing great stories… and of course, riding. Don and Brianna rode the Family Poker Run on Saturday and got some funny looks, because let’s face it: not every day you see a Suzuki V-Strom 1000 zooming across the desert. Yes, Don managed to get that machine through the terrain. 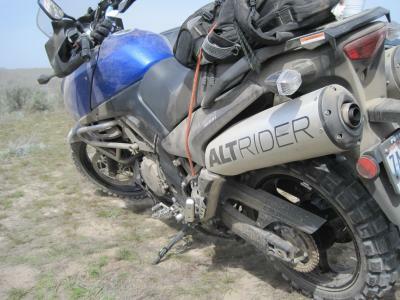 Armed with AltRider skid plate and crash bars, the V-Strom did well and shocked many a V-Strom owner who’d left his own at home in favor of a desert-loving dirt bike. But the rough route finally got Don on one of the big whoops, he had a slow speed get off and snapped the right blinker . It was a pretty minor bike injury for the Desert 100. 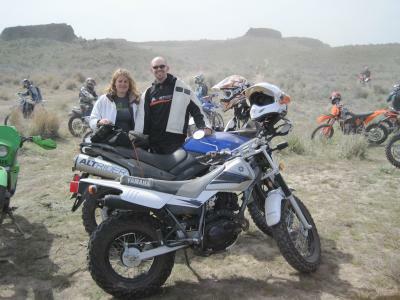 Next year, we plan to take several Adventure bikes out to the desert and try them out on the Dual Sport Ride. What about you? Let us know if you plan to join us! We can all ride out together and share stories while eating at the brewery. I bet we could even get Jeremy to buy the first round.